what thermometer do you use? The digital armpit thermometer we had from the hospital got broken so I am thinking of buying a new one. I read from here that the latest available technology is the non-contact infrared thermometer which can even be connected to a smartphone. I think this is ideal to easily keep track of temperature at certain intervals. As I checked for the prices here, it can really be steeper than the forehead or ear digital thermometer. But the thought of not waking up an extra fuzzy baby sounds entertaining. My baby also has the tendency to move around a lot, so the armpit thermometer was not really ideal. Is the price difference really worth it or babies don’t generally mind ear or forehead contact? What do you have at your own home? 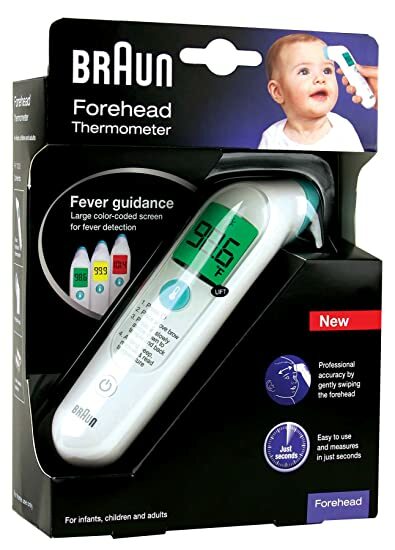 I have this Braun forehead thermometer. It's easier to use.